Learn about issues and any corresponding bills that could impact public power communities. Support legislation that provides for prudent, cost-effective and environmentally sound disposal options for coal combustion residuals, while minimizing the costs Duke Energy will ultimately attempt to pass on to all customers. Municipalities should not be required to subsidize private for-profit business that use municipal infrastructure and those users should pay their fair share of the costs. Ensure any changes to REPS allow municipal electric providers to comply with regulations in ways that are achievable, cost-effective and take into account the cost to consumers. Maintain and protect municipal electric systems existing territorial rights to serve electric load inside boundaries and outside municipal limits within reasonable limitations. Oppose legislation that would impose renewable energy mandates on municipalities or that would prevent municipalities from developing policies that were in the best interests of their citizens. We support the continued ability of municipalities to use tax exempt financing and advocate for the development of comparable tax incentives for all electric energy providers. We support Congressional interest in the electric grid but oppose passage of legislation that fails to adequately recognize the current federally mandated programs established under the North American Electric Reliability Corporation (NERC). We work with national groups on key issues that impact our public power systems, such as climate change, the Environmental Protection Agency's (EPA) promulgation of greenhouse gas rules, addressing new air regulations, monitoring Federal Energy Regulatory Commission (FERC) policies, and promoting nuclear power through energy legislation, including a clean energy standard. We work with national groups to advocate for the completion of the evaluation of Yucca Mountain as the long term storage solution for spent nuclear fuel and monitor legislative action on key issues related to disposal of nuclear waste. Work with national groups to advocate to retain local control over electric distribution systems. 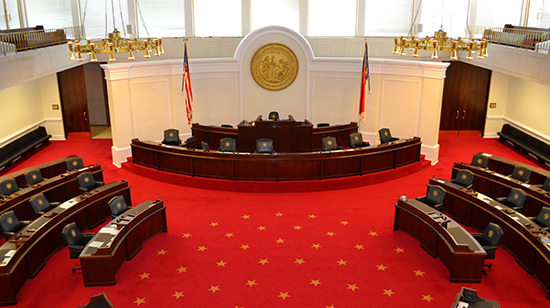 Read articles about how the legislative process works, and see who your representatives are. Sign up for email alerts on bills – add your name to the list.